1901 Nov. Born Rockferry. He seems to have lied about his age by a year when he enlisted. He is not in 1901 census and his older brother Stewart is given as 4 months old. 1919 Apr 24. 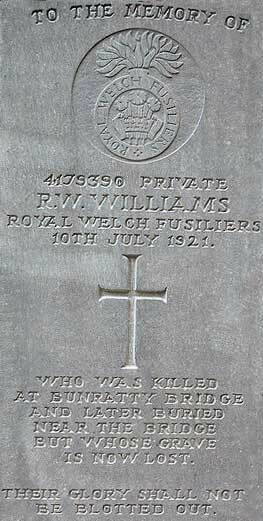 From RWF records William Reginald Williams was aged 18 5/12. He was an Apprentice to the Drug Trade and shown as born Rockferry (which is virtually Birkenhead). He is shown as Nil Former Service. Cause of death Accidental Drowning. For some (extremely frustrating) reason a batch of men enlisting at that time were given 356xx and 357xx numbers which to all intend and purposes should be mid to late 1915. It's a mix bunch of 1915 men and 1919 men and from what I've seen the 1919 men are mostly born 1900 onwards. There's no indications that they attested as Boy soldiers and put in Reserves etc. Straightforward enlisting and given a '1915' number. Son of Mrs. M. Williams No. 3 Abbey Green Chester. In May 1921 the East Clare Brigade of the IRA blew up the central span of Bunratty Bridge. There was an attempt to repair the bridge on the night of 9th - 10th of July. But the local I.R.A. sabotaged the bridge again on the Ennis side. At 2pm. On Sunday the 10th of July two British Army motorcycle despatch riders crossed the bridge from Limerick and, despite some local people trying to warn them of the breach, both plunged into the Raite River. Private Williams split open his head on the stonework and lost consciousness as he fell. The other rider saved himself but Williams was seen by a local publican Mrs Ryan and her daughter, to go under. His body was swept down the river and found by a local farmer two or three weeks later, caught up in bulrushes on the eastern bank two hundred yards north from Bunratty Bridge. During the civil war the Governor Generals secretary in Dublin wrote to Richard Mulcahy seeking help in recovering Williams body. In 1937, according to remembering the dead, a "Kipling Memorial"- Commonwealth War Grave - (ie the deceased isn't buried under the headstone) was erected in Bunratty cemetery. Oddly this comes up, which implies that there was further correspondence leading to the recovery of William's body, which is some time after the Kipling memorial was erected in 1925. Funeral Expenses. Claim of J. Desmond and Sons, Cork. Exhumation of (1) Pte R.W. Williams, Royal Welsh Fusiliers (2) Lieut S.L. Vincent R.F.A. 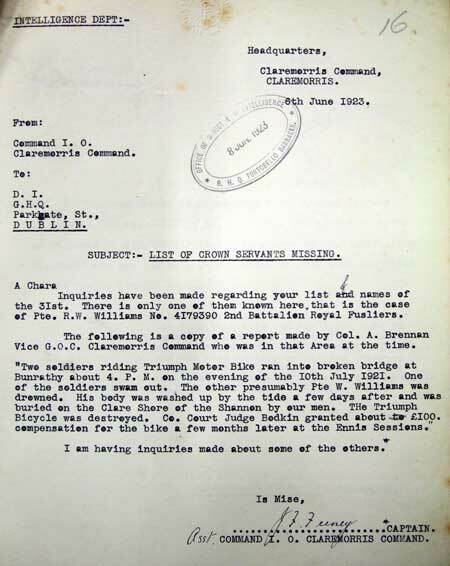 Correspondence from Army Finance Office concerning payment of funeral expenses incurred in the reinternment of the bodies of British soldiers killed in Ireland. 50/Miscellaneous/333 Reinternment of late Lieut S.L. Vincent R.F.A.